Blue Palm is a revolutionary charity initiative, headed up by a group of young students, who are changing the way you donate and communicate to disadvantages communities. They hope to be a voice that sheds light on the challenges facing care centres and charities in impoverished areas – through a shared aspiration to start making a difference in the world around us! With Blue Palm there’s no more place for excuses about getting caught up in your busy lifestyle! By using community Contribution Bins, set up in easily accessible places you would pass in your normal routine, Blue Palm allows you to make donations as you go about your daily business. These places include schools, varsities, shopping centres, business parks, estates and complexes. By making this process convenient for the average person, and by providing opportunities to fulfil a helping role within these communities, they hope to empower people to do good and provide aid where needed. 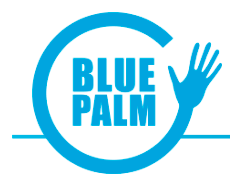 Blue Palm will be launching mid March, starting with Contribution Bins in Pretoria East on the University of Pretoria’s main campus, surrounding shopping centres and schools. The Open Window School of Visual Communication in Centurion, will also house two Contribution Bins.